A wood floor in a gymnasium can last close to a lifetime if kept dry. The problem is mother nature and other things beyond our control. 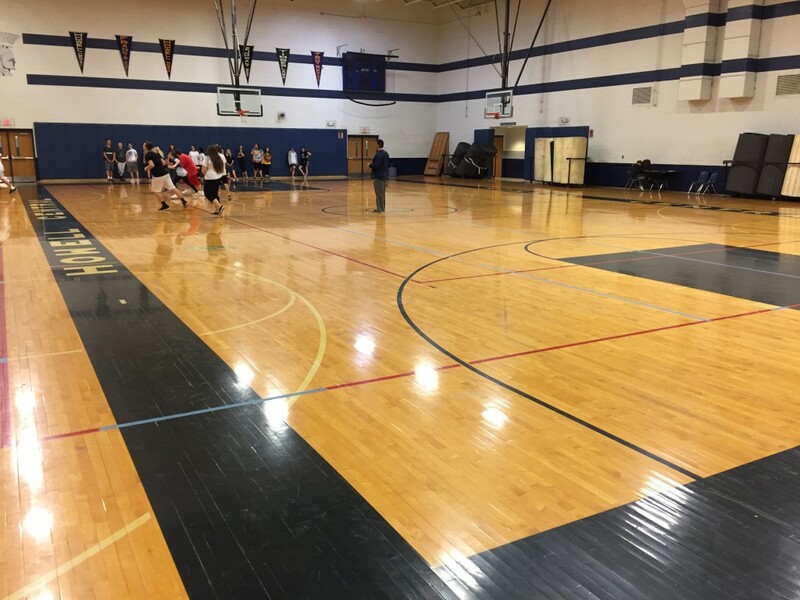 Roof issues led to water damage of the gym floor so we were called in to repair and refinish the floor. 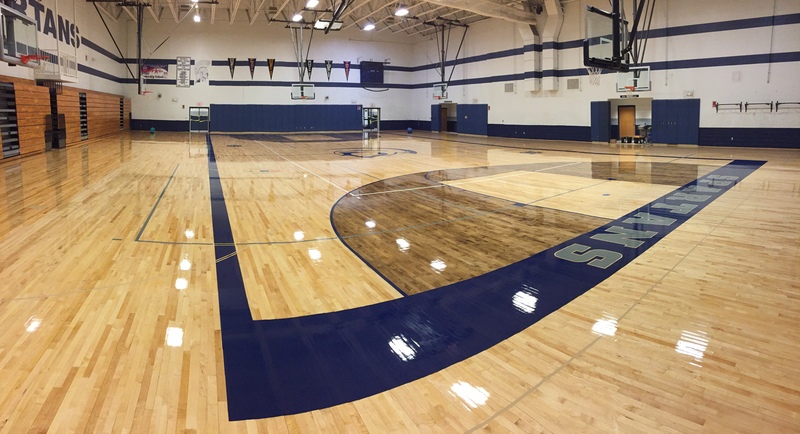 Gym Floor following patch & refinish. 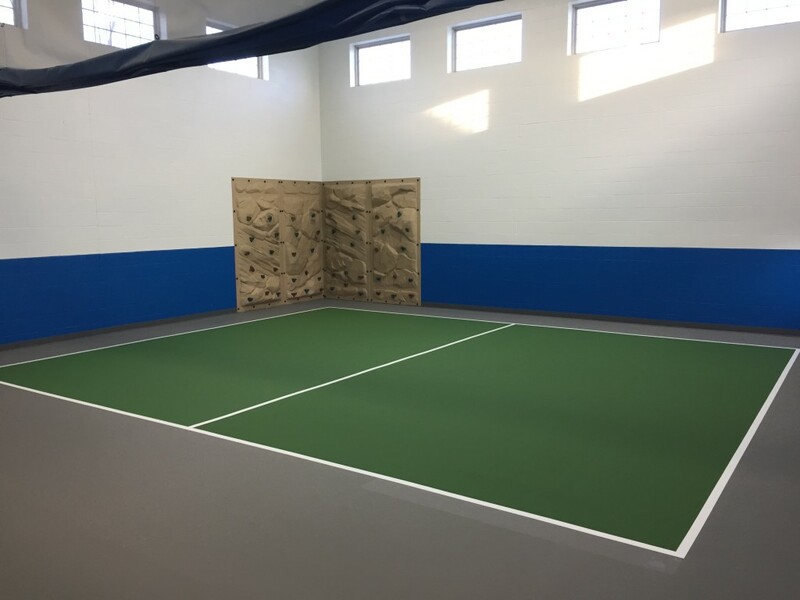 Though the Owner is inconvenienced with the down time of repairs, they often end up with an opportunity to update the court layout and logos. If your gym floor has current or past water issues, call today and we can assist in both evaluation and solutions (314)432-2260. Homeowner’s often try to get too creative in their search for the “perfect” floor. 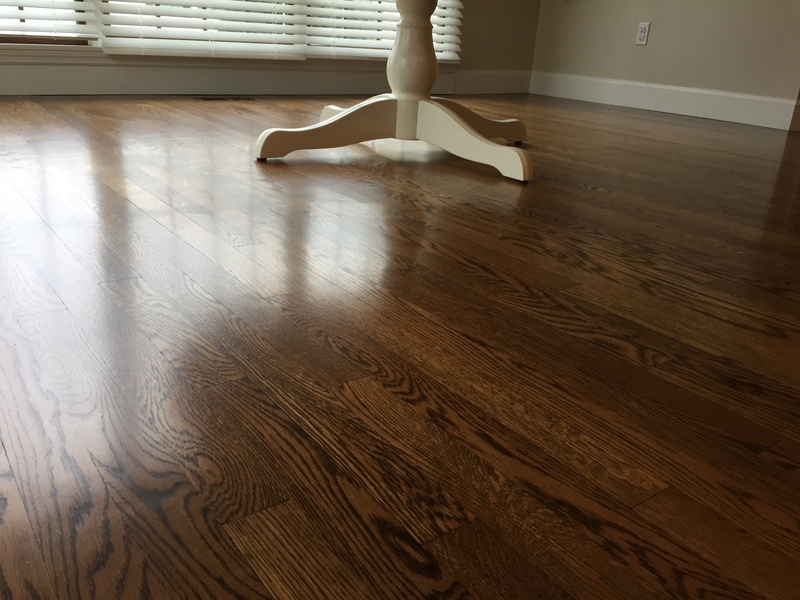 The picture above is a classic Select White Oak strip floor we installed throughout the Kitchen and Breakfast Room. The wood was sanded and finished onsite and stained to the Owner’s color selection. Here, the Homeowner needed the floor to be functional enough for a young family yet elegant enough to catch the eye. 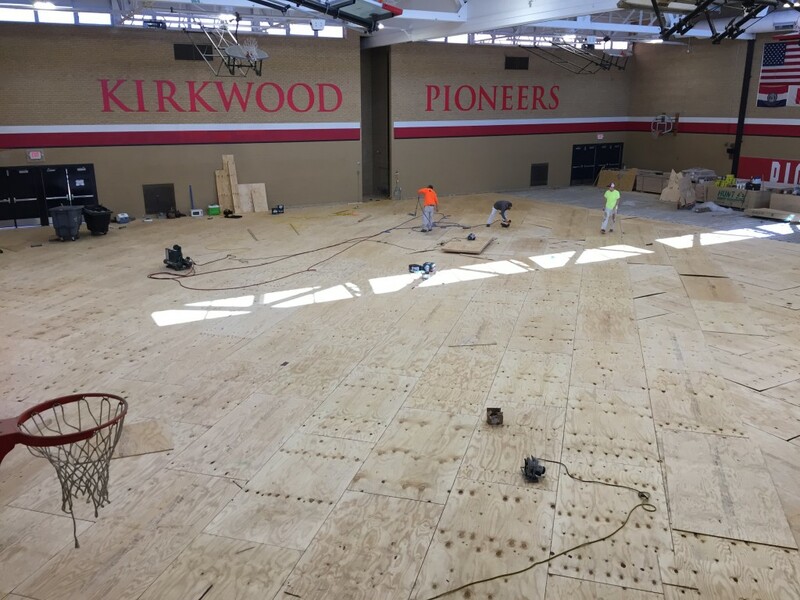 It’s always bittersweet when a floor with such history gets torn out, but we are underway with the replacement of the wood gym floor in the Denver Miller Gym at Kirkwood High School. While the kids enjoy the summer break, it is time to get down to business here at Missouri Floor Company. Shrinking breaks mean shorter duration’s to get full replacements delivered on time. We try to be proactive and sequence the projects within the time frames allotted. It takes communication, experience, and a solid relationship with the manufacturers to bring it all together on time. 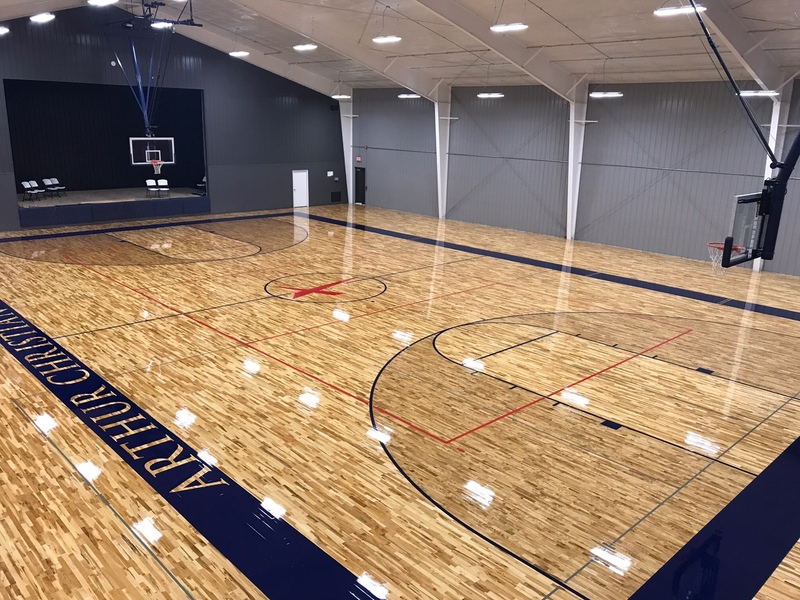 Missouri Floor Co. recently completed an installation of a new wood athletic floor in the gym at Arthur Christian School. What started as a simple phone conversation about budgets for a floor in their facility turned into a beautiful project within a years time. It’s always a good feeling to be part of a great plan that comes together. After water damaged the existing wood gym floor at the nearby U City Rec Center, Missouri Floor Company was called to evaluate the damage. Within 24 hours we were there to begin monitoring the damage. 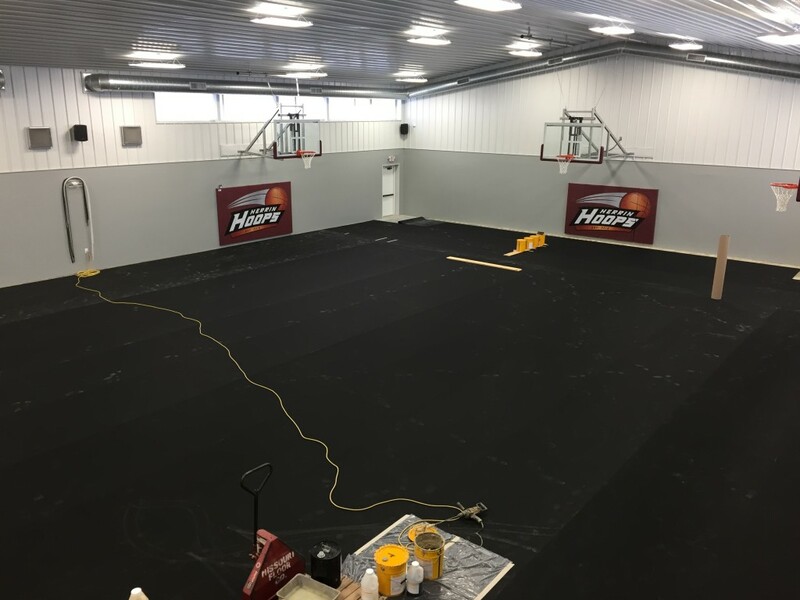 The floor ended up being a total loss which only started the process for further losses to the Owner due to the gym being shut down during replacement. We got creative using features available in the industry (Robbins XLplus “presanded” maple) and our crews committed to overtime to help expedite the process. The floor was turned back over to the Owner more than a week early to get them back in action! A big “Thank You” goes out to the facility for choosing Missouri Floor Company to tackle the project. Due to the various types of flooring and uniqueness of the facility, we entered the project in the Robbins Sport Surface of the Year competition. The Center was recently named as a finalist and we’re hoping to bring home a victory…. The project had an expedited schedule and construction issues that arise when working on a large project, but was overall enjoyable. It was a win for all involved and we are honored to be have played a part. There are more photos to come of the facility, check back soon. 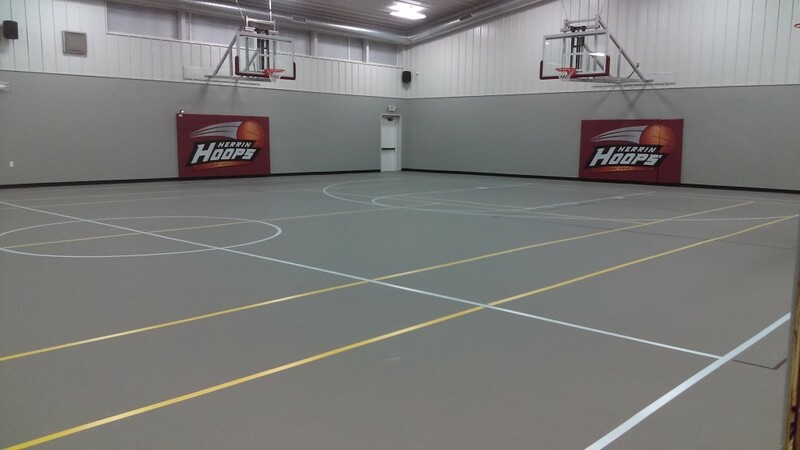 We completed the wood gym floor in the Gymnasium Addition at the O’Fallon, IL YMCA branch this past week. Listed below is a picture of the progress through the painting of the gamelines. This tends to be the fun part of the project where the Owner has a chance to customize the floor to their wants and needs. 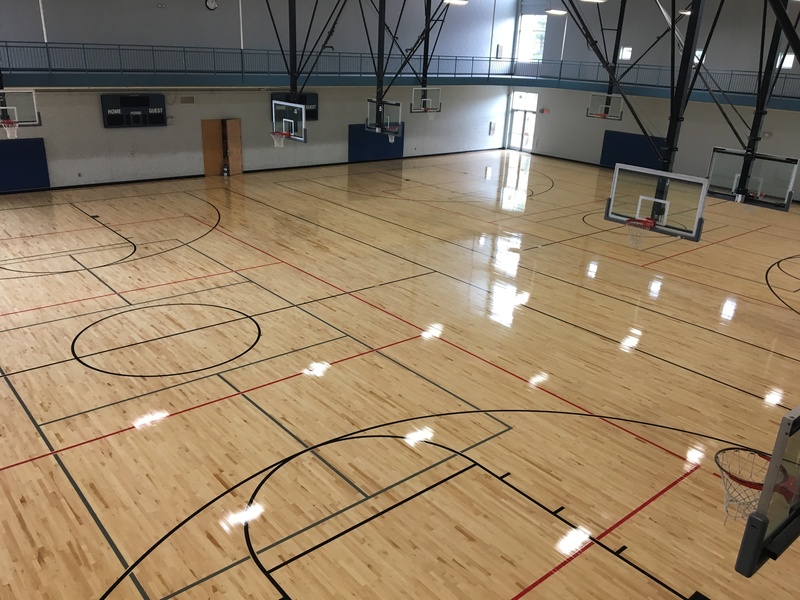 Missouri Floor Company and Robbins Sport Surfaces have enjoyed a strong relationship with the YMCA’s over the years and consider it an honor to install floors in their facilities. 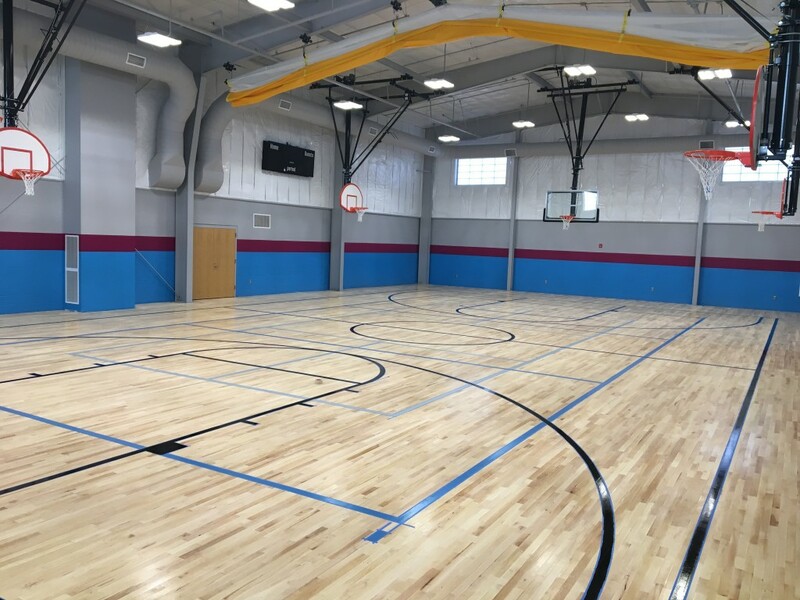 Missouri Floor was called to a local early childhood development school over a year ago to start planning for a better alternative to the existing gym surface. After discussing the use and expectations of the Owner, it was decided a Robbins Pulastic sport surface would be a great solution. The Owner began budgeting for the improvements and a year later had us set up to start. The cushioned shock pad and poured layer create a comfortable “seamless” material that provide a safe and sanitary surface for the children. All the materials are VOC friendly and designed to pass the toughest standards in the Country (CA). The multi-colored topcoat was decided on to give the kids a “field of play”. Robbins Pulastic floors have a range of colors available that can be used for just about any design. The Owner was looking for something unique that guests would remember as they enter the home. It’s safe to say they succeeded here with the beautiful entry floor! 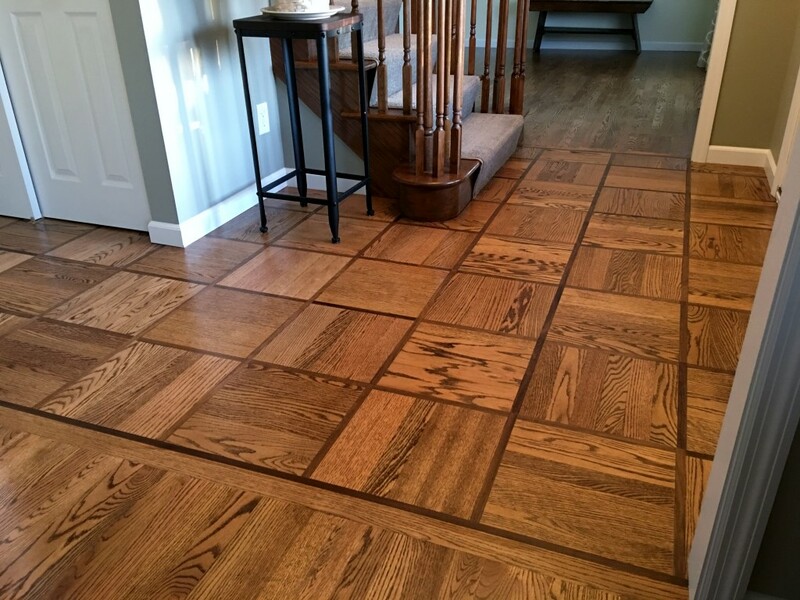 The custom wood design used red oak to match other wood flooring in the home and added a walnut feature strip accent. Once concern of the Owner’s was how everything would “flow” with the other wood areas. A common stain was used to bring everything together and as a highlight, it brought out the walnut feature strip. Everyone’s home lays different so don’t hesitate to call for us to come see what we can do in yours today! It’s not everyday you come across a “Home Court” but we’re adding this one to our list. Another successful installation by our crews. Ready for the next star!